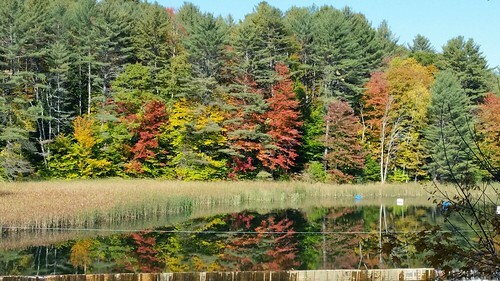 A line of trees with different foliage color reflected in a pond. I was at a dam (to which you can see the initial bits of at the bottom of the picture) and was struck by the row of trees and their reflection in the water. (We know I'm partial to reflections in photos). I liked the coloring of the trees with their green, yellow and even some orange and red. Most of these come through in the reflection, but not all. Then, of course, there is the tall grass between the trees and the water and even some of the sky in the upper right corner. All in all, it's quite picturesque--something I would imagine would make for good inspiration for a painting.